Eight 10 minute short films each written and directed by Māori women film makers. Following the death of a child, eight Māori women are confronted by guilt, pride and defeat but will ultimately risk everything for the greater good of their community. Short Synopsis: Eight female Māori directors have each contributed a ten minute vignette, presented as a continuous shot in real time, that unfolds around the tangi (funeral) of a small boy (Waru) who died at the hands of his caregiver. The vignettes are all subtly interlinked and each follow one of eight female Māori lead characters during the same moment in time as they come to terms with Waru’s death and try to find a way forward in their community. In Māori, waru means 8. Directed by: Briar Grace-Smith, Casey Kaa, Ainsley Gardiner, Katie Wolfe, Renae Maihi, Chelsea Cohen, Paula Jones, Awanui Simich-Pene. Written by: Briar Grace-Smith, Casey Kaa, Ainsley Gardiner, Katie Wolfe, Renae Maihi, Chelsea Cohen, Paula. 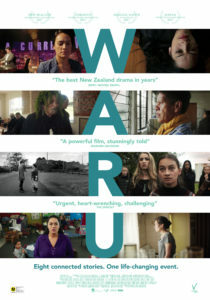 WARU is a film that is not to be missed!